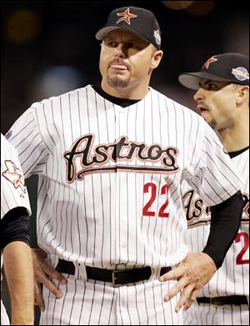 Yesterday, perpetual retiree Roger Clemens was in Houston to receive his National League Championship Ring. As usual, Clemens was asked about his plans for this season, whether he'll retire, whether he'll play, who he would play for, so on, ad nauseum. But then the conversation took a bizarre, and rather queasy, turn. Clemens was asked about the World Baseball Classic, specifically about the different fan communities from all across the globe. His response involved, uh, a discussion of why he was unable to get his dry cleaning in a prompt fashion. "They said, 'You've got no chance,' they told me," Clemens said. "I said, 'I'm going to get it tomorrow, right?' And then she goes, 'No chance, we're going to the game.' So we couldn't get dry cleaning done out there, but I guess the neatest thing about them was there were about 50,000 of them at Anaheim Stadium, Korea and Japan. We imagine Clemens having a similar discussion last season, after reaching on a single against the Dodgers, with first baseman Hee Seop Choi. "So, hoss, I'm glad I've got you here. Listen, my guy is charging me $25 for a shirt and $40 for a suit. Doesn't that seem insane to ya'll? Forty bucks? Is that what you charge? You surely charge less than that, right?"